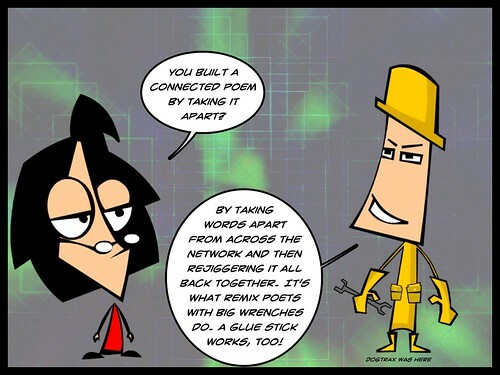 This week’s call for Creativity via E-Learning 3.0, coming on the heels of considerations of distributed communities, had me thinking of heading back into the words of others, and maybe finding a poem. What the poem would say, and how it would look, I couldn’t say. But I hoped a deeper and closer reading, with poetic eyes, might bring to the surface some connections and themes. And, in an ongoing effort to unpack the making of things in different learning spaces, I want to share the process of how I did it (if only for my own memory sometime in the future). I went back to the handful of blog posts from fellow El3.0 participants and read their reflections a few times. As words, phrases and sentences resonated with me, I pulled those pieces into a Google Doc as working space. It’s sort of a messy place, with words scattered in the document. Maybe I should have noted where the words came from there, but I didn’t, and now I don’t quite remember. One could make the case that it doesn’t matter, since the found poem is supposed to be taken from words across distributed spaces anyway. Once I had the Google Doc littered with words, I began to read through what I had there — through the lens of disparate parts in search of a whole. I opened up another document on Board.net, and began to create stanzas from phrases in the Google Doc. (Board is collaborative document platform). I resisted adding too many of own words — only those connector words between phrases. I was trying to avoid my own voice, for now, in order to surface the collective voice of us. I didn’t even use anything from my own reflective blog post. Once I had a flow of a poem going along the seams of our discussions — community and consensus, distributed web effects on learning, technology as a problem in search of a solution, and more — I circled back around, and began adding my own thoughts here and there — minimally, at best — in order to find some consistent voice across the stanzas and theme. Interestingly, the process flowed rather naturally, and the Found Poem emerged rather intact (a testament to the strength of the writing of my EL30 blogging friends more than my own curation). Thanks to the Time Slider tool in Board, you can even watch the construction of the poem unfold. I took a screencast of it in motion because this always fascinates me. It’s better when more people are involved, yet you can see some of the ways I was unfolding the poem top to bottom, and then dancing in the corners of the stanzas towards the end. So, now I had the poem. What to do with it? Well, it seemed to me that this kind of found poem, networked as it was, deserved visuals, so I turned to Lumen5, a digital story tool, and worked to create a visual found poem that I think quite nicely captures the voice, the spirit, the reflection, the wondering and wandering of us, as a whole. I created a few comics as visual openers for the videos, too. This entry was posted in EL30, Poetry. Bookmark the permalink. 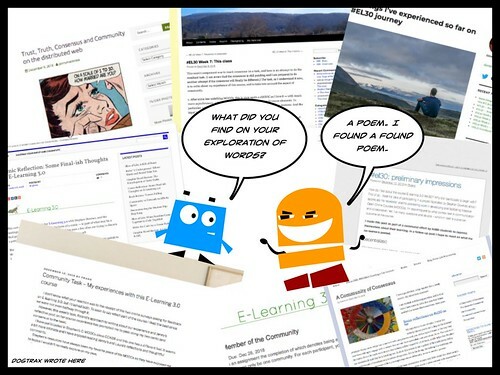 I make time every couple of days to visit Inoreader (introduced to me by Terry Elliott) and look at what you and others from #clmooc have posted recently. I treasure the articles you post and try to share them. I envy your creativity and ability to pull a wide range of different tech tools into your creations. Like a kid in a candy store, I watch what you create and the ideas you share and wish I could find people using the content on my blogs and web sites on a regular basis for this kind of writing and creating. At the same time, I share with the goal of inspiring others to learn from you and your work. May you enjoy a safe, healthy, happy, and hopeful holiday. Great to get a glimpse into your process for this Kevin, thanks for the inspiration.